For this months foodblog swap we’ve chosen the “Beetroot risotto with goat cheese and hazelnuts” by ongewoonlekker.com A foodblog swap means we get to cook a recipe from another food blog, but with our own twist. Inspired by her recipe we went full improv! 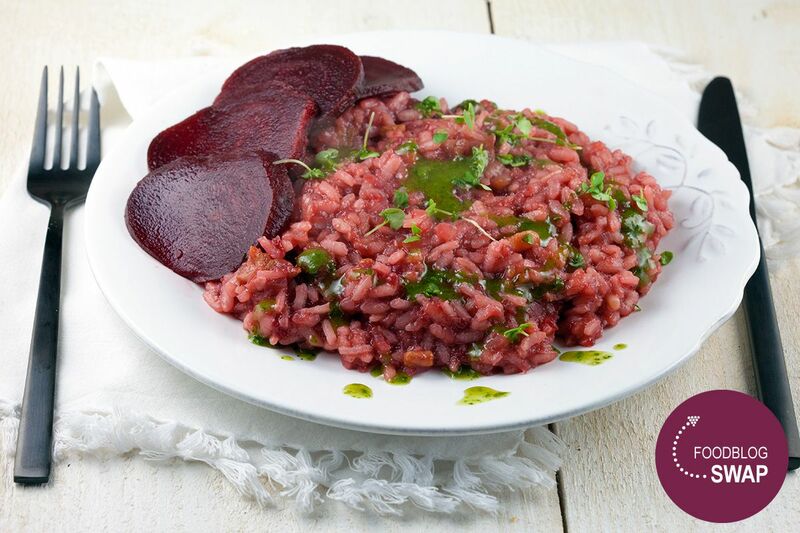 Thanks Jody for inspiring us to create this delicious beetroot risotto! PEEL and then dice the onion and clove of garlic. DRAIN liquid from the package of pre-cooked red beets. Save one red beet for garnish (optional). ROUGHLY slice the red beets, add into the blender, add in a squeeze of lemon juice and mix until smooth. DICE the streaky bacon. BLEND the flat leaf parsley, basil, olive oil together and season with salt and pepper. Set aside. HEAT the stock and set aside. HEAT up the large deep pan, add in olive oil and sauté the onions and garlic for 2-3 minutes. ADD the risotto and saute the risotto until slightly glazed. POUR in a nice big gulp of white wine, about 125 ml. Stir, and wait for the wine to reduce. COOK the risotto by adding in some of the chicken stock (not all at once!). Stir, add more stock when needed. Repeat this step until the risotto rice has almost been fully cooked. 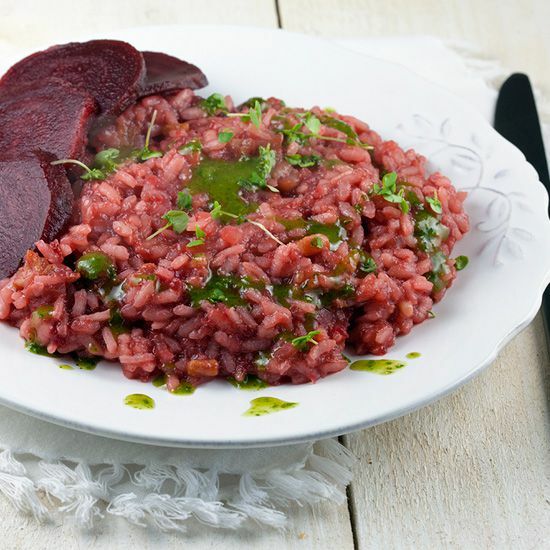 ADD the beetroot puree and ground cumin seeds about 5 minutes before serving the risotto. MEANWHILE heat up the small skillet and add in the diced streaky bacon, no need to add in butter or olive oil. Bake until crispy. STIR the streaky bacon through the risotto when the rice has been cooked. 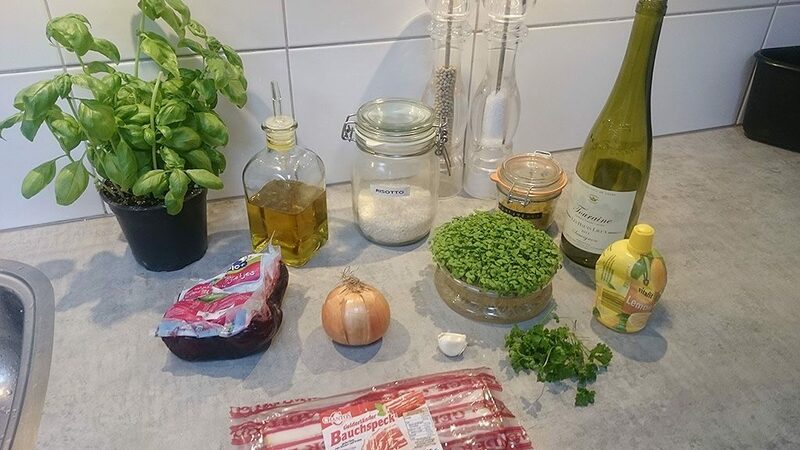 Season the risotto with pepper (bacon and stock is already salty). GARNISH with watercress and the herb oil. Enjoy!